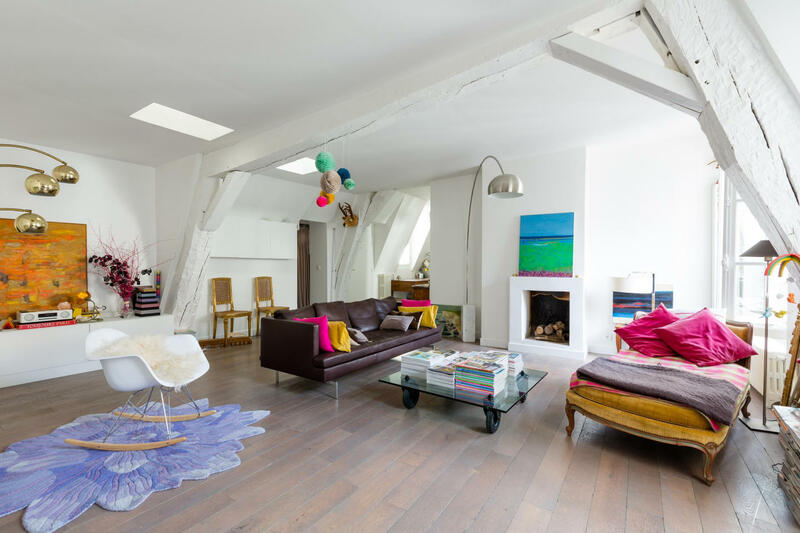 On this vibrant Le Marais street, 17th century splendour and playful creativity collide. This home’s ancient beams are painted as white as its walls, and on wooden floors the Perspex chairs and glass tables perch alongside whorled walnut chests. With its intriguing juxtaposition of old and new, this home is one for all moods. Placed beneath a grand crystal chandelier, the antique desk is a fitting place for study, while the master bedroom’s yellow velvet armchair, covered with a soft sheepskin and surrounded by diverse artworks, is a sweet and relaxing spot. Your hosts have many interests: she has just started studying psychology, and he’s fascinated by art and design. Rue Saint-Denis has been in her family for generations, but that hasn’t stopped them making their own mark. Character, though Rue Saint-Denis has it in abundance, never overrides comfort here. Despite the drama of this home’s dark-hued bathrooms, each is beautifully fitted. And while the sleek white kitchen contrasts in colour, it’s just as well-designed – especially the dining table flanked by velvet-topped benches. 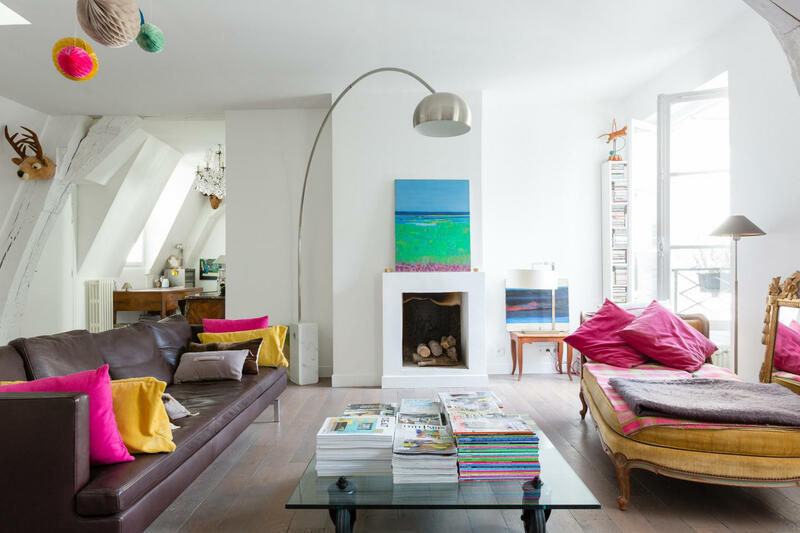 The sitting room is the space that really delivers, with its flamboyant chaise longue that overlooks the Paris rooftops. 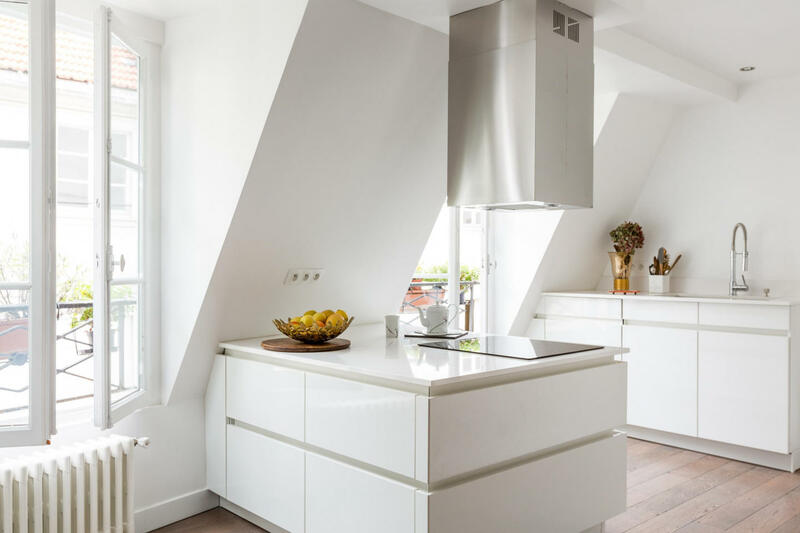 But don’t rest too long before exploring the city – the bustling shops and bars of Le Marais, exciting Ile de la Cité and the Louvre are all – incredibly – within walking distance. - The home is on the 3rd floor with no lift. - Please be aware that the shower room is located upstairs with low ceilings. - The laundry is located upstairs and has low ceilings with old beams. - There is no permanent hanging space in the second bedroom. - The last bedroom in under the roofs and has a low ceiling height.